Summer is just around the corner and I can’t wait for it to arrive! For me, Summer is not only about fun in the sun but also the enjoyment of entertaining. There is no better day spent than one in the sun with fresh and delicious food and surrounded by friends and family. With all this talk of Summer celebrations, I am feeling so inspired to create the most inviting tablescape. The table is the perfect place to let your creativity shine and become the center of attention. What a perfect conversation starter! 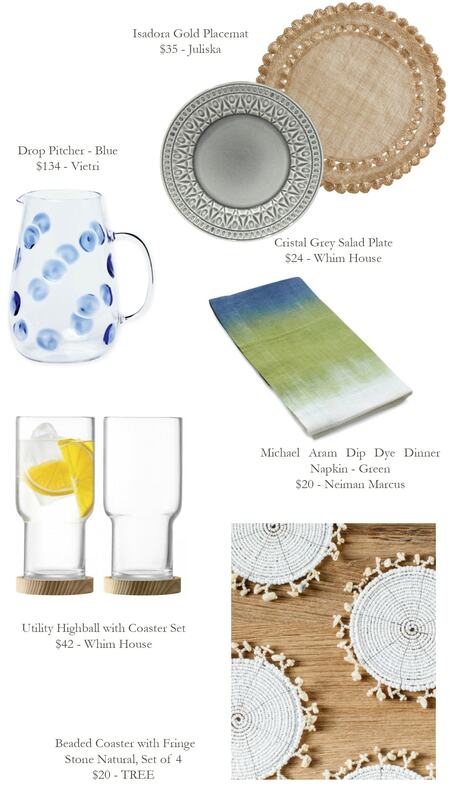 I have compiled a few items that have me dreaming of an al fresco lunch with fresh refreshments! Starting off with the place setting. A woven placement with a chic touch of gold from Juliska, layered by a grey, very versatile, plate found on Whim House. All completed with a super stylish ombre inspired napkin by Michael Aram. The blue dotted pitcher from Vietri is the perfect vessel for some fresh lemonade and every drink needs a glass! I fell in love with this pair of highball glasses on Whim House. The final piece, some fun beaded coasters from TREE (right here in Bellevue! ).